The Pantheon Rome Hotel is set to begin welcoming guests to a stylish hospitality experience in the heart of the Eternal City today. The Pantheon Rome Hotel is set to begin welcoming guests to a stylish hospitality experience in the heart of the Eternal City today. The new five-star address will impress travelers and locals alike with timeless elegance, modern luxury and creative hospitality, as well as the culinary excellence of Michelin-starred Chef Pasquale Palamaro. From its enviable location steps from The Pantheon, Spanish Steps, Trevi Fountain and countless other famous sites, to its individually designed guest rooms and suites, to its Divinity Terrace Lounge Bar with 360-degree views of the city beyond, The Pantheon Hotel is a sophisticated sanctuary all its own in ancient Rome. Designer Marco Piva of Studio Marco Piva in Milan was brought on to execute The Pantheon Hotel’s vision, drawing inspiration from the heritage and vibrancy of the city while fashioning the hotel’s interior and exterior details. Marco Piva’s primary inspiration comes from the nearby Pantheon’s geometry, light and building materials. Circular motifs, marble and brass are incorporated prominently throughout the hotel, while a careful study on the use of light creates the effect of scenography and a sense of surprise. Marco Piva also used light effects to highlight various materials and architectural elements. For example, original arches in the Gallery leading off the lobby are covered in metal and embedded with lights to create the appearance of architectural illumination. Each of the 79 individually designed guest rooms, including 20 suites, are characterized by calm and comfort, with custom designed furniture and furnishings and original works of art. Luxurious upholstery is abundant; bathrooms are fashioned in marble and glass; and color schemes gradually brighten on each ascending floor. 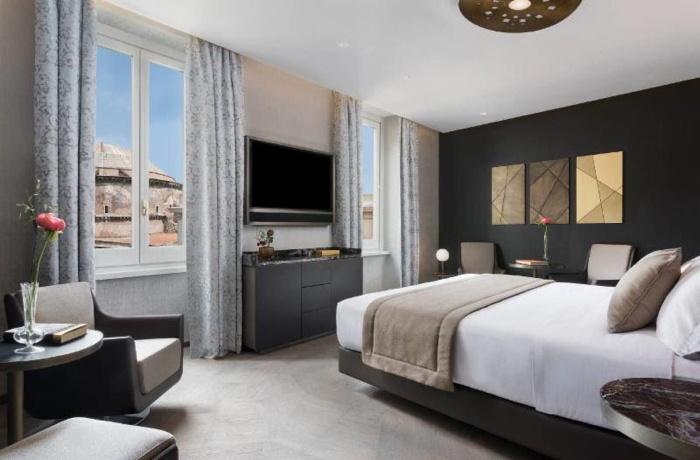 Each guest room also features a glass display case showcasing a rotating selection of items inspired by local Rome events and happenings, such as design shows and cultural events, which bring to life the never-ending evolution of the surrounding city. Standard in-room amenities include comfortable king beds; individually controlled heating and air-conditioning; OLED Smart TVs; complimentary Wi-Fi Internet access; and complimentary Samsung Smartphone Manets. In addition to a standard mini bar, each room also offers a second mini wine cellar equipped with three full-sized bottles of Champagne, red and white options. Some guest rooms also offer exceptional views of sights including The Pantheon, Piazza Sant’Eustachio and Via di Santa Chiara outside the hotel. On the ground floor, the hotel’s lobby is calming and inviting, featuring a simple marble slab registration desk – though guests are also invited to use Marriot Mobile Guest Check-in service. The intimate Lobby Bar is similarly cozy and sophisticated with Sahara Noir polished marble floors and a large circular lighting fixture reminiscent of the Pantheon’s oculus. Together, they create a calming welcome from the bustle outside. A native of Ischia in the Gulf of Naples, Chef Pasquale Palamaro leads the hotel’s signature gourmet dining experience at Dionysus Restaurant. Palamaro’s lifelong passion for cooking has already led to a Michelin star, awarded in 2013 for his role at Indaco restaurant of Hotel Regina Isabella on Ischia. At Dionysus Restaurant, Palamaro fashions fresh local ingredients into seasonal offerings bursting with the flavors of the Mediterranean. The chef’s opening Tasting Menus, with themes of “spring walks by the sea” and “a sea of ideas.” The menu is complimented by a very extensive, international wine list with over 400 labels. Guests entering Dionysus are greeted with contemporary Roman elegance, with original bronze artwork handcrafted by a local artisan and an LED glass window into the kitchen that allows diners to watch as their dishes are being prepared. The staff can control the transparency and opacity of the window to allow for a theatrical experience. There is space for 35 guests beneath a dramatic lighting fixture that diffuses warm light from the high-vaulted ceiling. Six stories above street level, Divinity Terrace Lounge Bar invites guests to soak in 360-degree views of the surrounding rooftops, seven domes including The Pantheon, and the beauty of the city beyond. It’s a stylish setting for socializing and relaxing, with an impressive wine collection and a light, informal menu of dishes. Serving as a nod to the city’s history, Divinity Terrace Lounge Bar celebrates the seven planetary divinities to which The Pantheon is dedicated. A different divinity is celebrated each day of the week, reflected in the lounge bar’s cocktail menu. The terrace, with seating for 50, offers a sleek and casual design palette with handcrafted grey sofas and beige arm chairs. In addition to lounging, guests can reference plaques along the edges of the terrace providing information on landmarks that can be seen from each vantage point. The interior area of Divinity Terrace Lounge Bar offers seating for 38 and features white statuario marble floors, an intricate brass wall installation and an area that can be sectioned off for private events. Nearby, the dedicated Breakfast Area serves as a breathtaking setting to start an adventurous day in Rome. The space features indoor and outdoor seating for about 90 and dramatic oversized windows that frame The Pantheon. Guests can enjoy diverse menu items ranging from smoothies and vegan options to customized crepes and omelets while taking in the picturesque landscape of terracotta rooftops and domes that surround the hotel. Additional public areas within the hotel include a Gallery leading off the lobby restored from the original building and a Boutique located just beyond the Gallery featuring luxury items from top-quality Italian designers. Be among the first to experience The Pantheon Iconic Rome Hotel with a special opening rate on Classic Rooms starting at $489 (€400 + VAT) per night. There is also a Special Opening Package featuring 20% off stays of two nights or more, breakfast included and a room upgrade based on availability.